Recovered from the site of the Battle of the Egadi Islands (Aegadian islands), northwest of Sicily, the helmet is a Montefortino, a Celtic style-helmet that had been worn across Europe, also popularly known as a "Roman helmet". These are easily identified: they look like half a watermelon with a knob on top and cheek flaps down the sides that tie at the chin. However, the newly discovered helmet has a unique feature: what appears to be a relief of a lion's skin embracing the central cone adorning its peak. Only one Montefortino helmet is known to have a relief on top, that appears to show a stylized bird. The helmet's dating is based, among other things, on pottery jars and other debris discovered on the sea floor at the site. 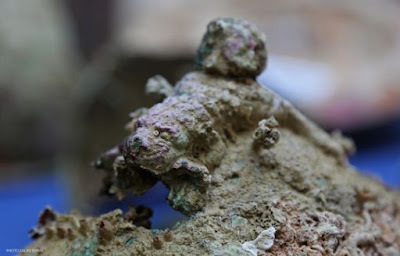 It was heavily encrusted after more than 2,000 years under the Mediterranean Sea and is undergoing cleaning and conservation that the archaeologists hope will reveal more details. The find is the latest in a string of discoveries made this year using unmanned submersibles as well as divers that have changed our understanding of naval tactics during the First Punic War (264-241 B.C.E.) , which knocked out Carthage, and made Rome lords of the sea. Diving at depths as deep as 120 meters, the marine archaeologists are surveying an area of about five square kilometers, littered with the relics of this decisive war. For much more information about the battle and finds, go here.